My name is Lachy and I am based in Melbourne, Australia. I started this blog in October of 2009, and since then it has exceeded my wildest expectations. I am a huge fan of good music. In fact my life virtually revolves around it, from listening to my iPod nearly 24/7 to getting out to gigs and festivals with mates whenever possible (and much to the detriment of my bank account). I started this blog as a way of organising my own thoughts on music, as well as a means to share what I see as ‘real music’ with anyone that will listen. 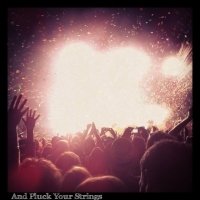 The name ‘And Pluck Your Strings’ is taken directly from the lyrics of Blood by The Middle East, which was a song that I simply could not stop listening to when I created this blog (and this obsession has continued to this very day). Peace, and continue enjoying music. My name is Tristan Clopet and I’m a singer-songwriter based in Miami. I’ve have 3 EPs and am gaining a bit of traction worldwide–57 countries thus far. The reason I am getting in touch is because I noticed you gave a review of Vampire Weekend–that’s one of my favorite albums of the year! I recently started doing a series where I cover some of my favorite songs called “Living Room Series”. Last month I did a cover of “Cousins” that I think you’d appreciate. Let me know what you think of it–the good the bad, and the ugly. I also wanted to inform you that I just released a new EP out called “Purple” last month–I think that you and your readers would like it. It has a bit of Jeff Buckley influences mixed with a little funk. I know we are in a recession and I am offering it to listeners for whatever price they would like to pay on my homepage (even a penny). I know time is scarce, but if you could give Purple a listen and review, I’d love to read it. Even if negative, I really respect your taste and knowledge and music, and would be interested to hear what you think. If you’d like a physical copy of the cd or a t-shirt, shoot me a size and a mailing address and I’ll be sure to get one out to you.